Wonderful tiny size and great variety of vivid colors ,Each bead has a hole that runs all the way through the bead for stringing purposes.Glass pearl beads are extremely effective when used with crystal beads. 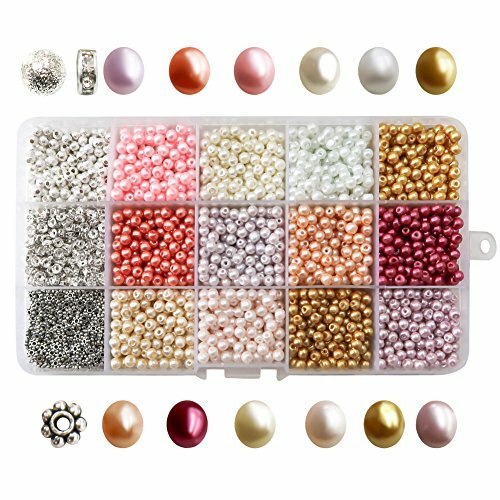 The facets of the crystal are very complementary to the smoothness of the glass pearl beads.Great kit for DIY bracelet, necklace, dress decoration, jewelry accessories, gifts and other crafts. Welcome to share your handmade !!! 1. Colors of all our products as shown in the respective pictures are close to the actual color. This is different because color shade is different from one computer monitor to another. This means these colours, which you see on your screen, may not be in the same shade as this color seen on another person's computer. All descriptions of the goods specifications and particulars to be supplied are approximate only.